An album of 12 + 1 intermediate to advanced pieces for lever harp. 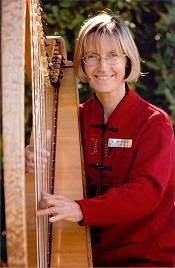 Eight are original compositions by Canadian harpist Alison Vardy and the remaining 5 are Alison's arrangements of beloved tunes from diverse cultures, with a variety of rhythmic left hand accompaniments. Wide range of keys used from 3 flats (Eb) to 2 sharps (D) and with frequent use of accidentals within the pieces. You can view the first 2 lines of each song by clicking on links #1 to #13 below. When Alison receives your payment she will email or mail you the album + cover sheet and index.